Eureka, CA (October 1, 2017) – The 25th annual Fall Spectacular took place at Redwood Acres Raceway this past Saturday and Sunday. In addition, it was the first annual Dennis Wendt Memorial race. Beautiful weather graced the track on Saturday and Sunday while Friday’s open practice was halted for a time due to rain. 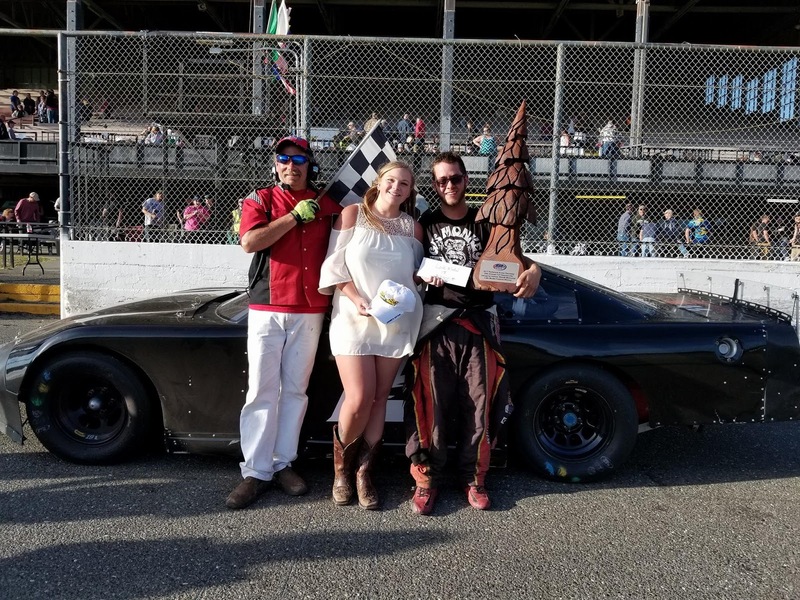 The weekend’s action was presented by Mid-City Motor World and it was a memorable two days of racing at the 3/8-mile paved track. Dave Rogers set fast time in the California State And Federal Employee’s Credit Union roadrunner division with a 19.811. The first 10 laps of the first feature saw Bob Ratzlaff and Nick Ford exchange the lead several times. On lap 11 Ford took over. Rogers made a charge in the late going but was unable to catch Ford. At the line it was Ford taking the win followed by Rogers, Daniel Buell, Ratzlaff and Lindsey Zito. Race two featured a spectacular incident in the late stages. The field ran the track in reverse for this race. Going into the first turn, Rogers got sideways collecting Buell. Rogers’ car rolled over once before landing on its wheels. Thankfully Rogers was okay. The incident allowed Ford to take the lead and sweep both races for the night. Buell was credited with second while Rogers was scored third, Andy Savage fourth and Ken Eastburn fifth. Only one main event for the division took place on Sunday. Rogers returned from his incident the previous night to dominate the race. It only took him two laps to go from the back of the field to the front. Rogers went unchallenged the rest of the way to take the victory. Michelle O’Dell finished second while Buell narrowly beat Ford to the finish line for third. Lindsey Zito rounded out the top five. Buell was crowned track champion for the roadrunner division. Qualifying for the Nor-Cal Automotive Legends was led by Daniel Whitley with a 17.982. Brian Kamisky took trophy dash honors and earned pole position for Sunday’s feature by winning the heat race. The 40-lap main event was dominated by Kamisky. All race long he was pressured by Brad Curtice. With five laps remaining, Curtice was able to take the low line under Kamisky to take the lead. Curtice was able to hold on from that point to take the win and the $500 purse for the victor. Kamisky placed second over Buddy Cox, Tyler Peach and Tyler Krupa. Peach locked up the track championship for the Legends by starting the feature event. Brett Murrell’s 18.167 time in qualifying for the Humboldt Hydroponics mini stock division was good enough to earn fast time. Jordon Paiment was the trophy dash winner while Brett Murrell took the win in the heat race. Brett Murrell used pole position to lead the early portion of the 40-lap feature. Contact on lap 13 between he and his father Brian Murrell, Sr. forced both drivers to restart at the tail of the field. Eugene Palmer took over and pulled out what looked to be an insurmountable lead. Unfortunately for him, a caution with 15 laps to go bunched the field. On the restart, Murrell, Sr. took over the lead and was able to hang on until lap 35 when Brett Murrell regained the top spot. Brett Murrell was able to hold on from there to take the main event win and seal the track championship for the mini stocks. Murrell, Sr. took second with Scott Taylor, Palmer and Trevor Eacret completing the top five. Brett Murrell’s victory earned him $500. The Lone Star Junction Thunder Roadsters had the usual trophy dash, heat race and main event both days. Paul Peeples, Jr. set fast time on night one with a 17.206. Tommy Payne took the dash win while Peeples scored in the heat. Payne held the age on the opening lap of the 30-lap feature but gave way to Peeples on lap two. Nobody had anything for Peeples on the night as he was able to run away from the rest of the pack to take the win. Allen Olson finished second followed by Ronnie O’Neil, Paul Baker and Craig Baker. Allen Olson set quick time in Sunday’s qualifying with a 17.378. Olson followed that up with wins in the trophy dash and heat race. O’Neil led the first two laps of the main but on lap three Olson took over. Olson and Peeples had a nip and tuck duel for the race lead. On lap 16, Peeples maneuvered under Olson to take the lead. Olson maintained a close position on Peeples the rest of the way but didn’t have the strength to mount a serious charge. At the finish it was Peeples winning. Olson, O’Neil, Payne and Paul Baker completed the top five runners. O’Neil was the division champion, taking the title by starting the main event. Big money was on the line for the Fortuna Wheel & Brake bombers thanks to Four Star Realty and Lally Motorsports. The winner of each twin 50-lap main events was given $1,000. An additional $1,000 went to the driver with the best average finish in both features while another $1,000 would be awarded to a driver who was able to win both races. Loren Powers, Sr. was fast time for the bombers with an 18.262. Mike Sullivan took the trophy dash win. Heat race one was won by Jim Redd while Sullivan’s win in heat two earned him pole position for the first 50-lapper. Sullivan dominated race one, leading from start to finish however he was challenged all race long. Brian King was Sullivan’s biggest competitor and the two raced nose-to-tail for the majority of the race. At the finish, Sullivan’s win was less than half a second over King. Nick Green finished third over Powers, Sr and Ryan Walters. While taking his trophy, Sullivan pulled the number eight pill which was the inversion for the second feature event. This gave Sam Brown pole position. Walters used the outside front row position to take the lead at the start. On lap five, King took over the lead. Sullivan methodically worked his way through the field, finally moving into the second position with 14 laps to go. The front two were cat-and-mouse the rest of the way. With two laps remaining, Sullivan moved to the outside of King. On the white flag lap, Sullivan found enough grip to get by King. Coming off the fourth turn, the two drivers were side-by-side with Sullivan hanging on to sweep both races earning $4,000 for the day. King placed second followed by Walters, Powers, Sr. and Richard Knight. John Lally took track champion honors for the bombers. 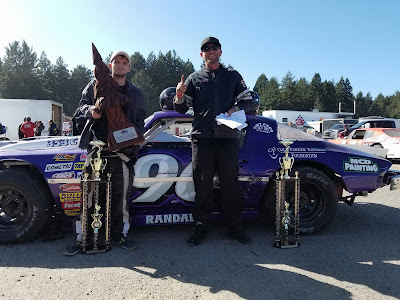 It was the final point race for the Mid-City Motor World late models but the first leg of the two-race Super 6 Late Model Challenge Series playoffs presented by Anderson Logging, Danielson Construction and North Coast Lighting And Electric. Brandon White’s fast time of 15.828 was quickest of the 21 cars that qualified and earned him $100. The winner of each of the qualifying heat races also earned $100. Eddie Klein won the first heat while Marty Walsh took the second. David Miller’s win in the third heat race gave him pole position for Sunday’s Mid-City Motor World/Dennis Wendt Memorial 100. Miller used his first place starting spot to his advantage at the start to take the lead. After a few caution flags in the first 20 laps, White took over the lead on lap 21. Lap 29 proved to be a tough lap for several competitors as several caution flags flew. The most notable was a wreck by Steven Gannon coming off the second turn. Gannon was struggling throughout the race and the incident prevented him from winning the track championship. As the race passed the halfway point, Walsh began to make himself noticed as he took second place on lap 50. Lap 60 saw what was the most controversial incident of the race. Going into turn one while racing for second, Mic Moulton and Walsh made contact sending both cars spinning. Tim Crenshaw had nowhere to go and was collected in the melee. Walsh’s car rolled over on its top necessitating a red flag. Thankfully none of the drivers were injured in the crash. Following the incident, the race calmed down as there weren’t any serious incidents the rest of the way. In the final 20 circuits, David Henderson moved to the second spot after having to overcome two flat tires. Henderson got right on White’s bumper. A caution in the final 10 laps proved to be to White’s advantage as it allowed him to cool his tires. Henderson couldn’t muster enough strength to get to White’s bumper in the closing stages. At the finish it was White taking the victory and $2,000. Henderson’s second place earned him $1,500. Derek Copeland had a top five car all race long and came home with $1,000 for third. Miller took fourth and $800 and Luke Hall fifth with $750. In spite of not being able to make it to the finish, Moulton was able to take the track championship for the late models for the second year in a row. With his win White leads the Super 6 Late Model Challenge Series point standings going into the Fall Classic at Ukiah Speedway, the final race of the series in 2017. His advantage is only two points over Henderson. The other drivers eligible for the championship in the playoffs are Moulton, Walsh, Gannon and Ryun Leazer. Moulton is 15 points behind White. Walsh is another two points behind Moulton. Gannon is 22 points behind the points leader while Leazer is 28 in arrears.